Wings of Twilight is a fantasy book written by Hans Cummings and published by Rite Publishing. Hans Cummings has written a book that introduces readers to the fantastic world of Calliome and the beings that inhabit it. Wings of Twilight is a reverse dungeon crawl that looks at the lives of the “monsters” that inhabit the legendary Twilight Dungeon. The story is full of your usual suspects when it comes to fantasy stories with an interesting twist. For this book, I’ll start from the outside and work my way in. 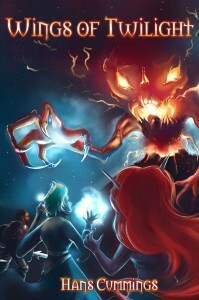 The cover art by Rowena Aitken ( http://www.rowenaaitken.com) is well done and is mostly relevant to the story, but the fiery figure emerging from the volcano reminds me of an angry great pumpkin/scarecrow hybrid with a 70’s style afro. Ms. Aitken takes what I like to call a “World of Warcraft” approach to elves. Her elves have long, almost antenna-like ears rather than the normal Vulcan/Tolkien types that I prefer. I went over to Mr. Cummings’s site (http//hccummings.wordpress.com) and under the My Projects/Wings of Twilight section, Mr. Cummings has posted individual pictures and descriptions of some of the main characters in his novel. These depictions really brought things home for me and were a welcome online easter egg. The first two pages are beautifully rendered maps of part of the world of Calliome. The cartography was done by Jonathan Roberts and is top notch! My review copy was read on an iPad 2 and viewing these maps was both a treat and a pleasure! Both maps are ready to be included in any RPG sourcebook. There is nothing innovative about these maps but they are beautiful, useful maps that help Mr. Cummings’s novel feel even more alive when combined with his outstanding writing. Now for the novel! When I first started to read Wings of Twilight, I thought it might be an unauthorized novelization of Dungeon Overlord. For those readers not familiar with Dungeon Overlord, it is a game where you run a dungeon. You build a dungeon, set traps, and arrange your “monsters” to thwart adventuring parties that are “invading” your quaint little abode. That was my first mistake. The majority of this novel focuses on a 7 foot tall, winged Sarvesh, the Marshal of the Twilight Defenders. The Twilight Defenders are a group of “monsters” who act as first response defenders for the infamous Twilight Dungeon. Sarvesh is not sure if he is a demon or a fiend, but he knows his job and he does it well. The Twilight Defenders consist of a minotaur, twin draks (think kobolds), a two headed giant, and a golguthron, “a smelly scavenger with greenish-grey rubbery skin, four eyes upon stalks, three legs, two tentacles and a mouth big enough to swallow a human whole.” A motley crew to say the least. On the flip-side, we are introduced to Strom Lightbringer and his fellow adventurers. Strom’s party includes a thief, a squire, an elven mystic, and a sorcerer. This adventuring party is seeking to rid the world of evil and to “take down” the Twilight Dungeon. Each party member has their own motivations for embarking on this daunting task and most of those motivators will not be surprising to anyone who has read a fantasy novel or created a character for an RPG. As the novel progresses, we learn that there is fractious intrigue afoot in the Twilight Dungeon such as a budding love story between Sarvesh and Suri, a medusa and a vampiric creature who is feeding on the nasty, nasty blood of bottom-feeding goblins. Meanwhile, Strom and his merry band are killing draks, dealing with bad weather, and learning why most people who play RPGs call Lawful Good, Awful Good. Earlier in my review, I mentioned mistakes. Well, here is where I fess up to a few more mistakes I had coming into this novel. Based on my interpretation of the Great Pimpkin/Scarefro hybred creature on the cover, I set the bar low. As I started this book, I was worried that Wings of Twilight was going to be yet another cookie cutter fantasy novel written by someone who couldn’t let go of a campaign they played years ago. Mr. Cummings is a gamer and when you start this book, you will see that it is riddled with stereotypical fantasy tropes. Lawful Good fighters out to rid the world of evil, magic using elves that never seem to get dirty, filthy goblins, and a trap-filled, legendary dungeon with an ominous name. I’ve read this story… in fact, I’ve role-played this story. Why would I want to go through it yet again? The answer is simple: Hans Cummings. Mr. Cummings takes all of these “been there, done that” plot elements and reshapes them into a novel that is interesting, well-written, and at times, surprising. This book does not go for shock value. It is not a sprint. This book actually felt a little like Christmas. Imagine walking into your living room and seeing a large bike-shaped present in the corner. The bike is wrapped and you know it is a bike, but you don’t know what type of bike it is or even what color it is. Your parents won’t let you open it until all of your other gifts have been opened. You open all of your other gifts and enjoy them, but in the back of your mind, you know that the bike is waiting to be opened. That is exactly how Wings of Twilight felt. After the first few chapters, I had a decent idea about how the book was going to end (I knew it was a bike) but the deeper I got, the more gifts I got to open and the happier I became. When I had opened all of those little literary gifts and finally got to the end (the “Bike”), I was still surprised. The world of Calliome could easily be used in almost any fantasy setting. I actually wouldn’t be surprised if we don’t see a sourcebook soon. None of the concepts in this book are original per-se, but they are all handled with such love and grace that most people will be hard-pressed to not like this book. The concept of running an adventure where the players are defending their dungeon homes from adventurers is always fun. Who doesn’t want to play a minotaur necromancer or a drak trapsmith at least once in their gaming career? There are some great ideas that any DM or GM can use at the table and the dungeon map at the back of the book could easily inspire a hack-and-slash dungeon crawl that your players will not soon forget. Overall, Wings of Twilight is a superbly crafted, entertaining yarn that attacks role-playing standbys at an obtuse angle. This book is well worth your time and money! Mr. Cummings is working on a second novel that is a follow-up to Wings of Twilight entitled Iron Fist of the Oroqs due out sometime this spring. If you are interested in learning more about Mr. Cummings and his work, head over to http://hccummings.wordpress.com/.